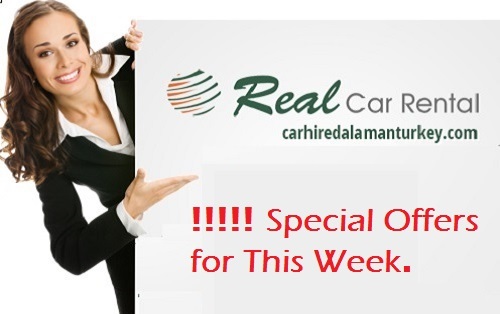 Carhiredalamanturkey.com is a reliable and economical car hire supplier located in Dalaman and Fethiye since 1993. Friendly service, bright new cars and lowest rates are our company policy. When you hire a car from Dalaman Aırport, you are free to go to your destination like Fethiye, Kalkan, Kas, Marmaris, Gocek, Bodrum, Izmir, Antalya without transfer costs. In order to make your visit in Turkey relaxing and enjoyable, carhiredalamanturkey.com is looking forward to serving you wıth a cheap car hire service from Dalaman Airport. excellent service; honest and reliable, I would highly recommend. What’s Not Included in your Car Hire? Optional SLDW Cover (Super Excess Cover "0" excess). What’s Included In Your Car Hire. What You Need to Book a Car? Your British or International driving licence. carhiredalamanturkey.com is owned by Unsaller Otel Insaat Turizm Ltd. This company is a member of the Fethiye Chamber of Commerce and its registered office is in central Fethiye. The company is also a member of the Southern Aegean Car Rental Association. In addition, within the scope of the company, we offer under the name of Sunworld Property real estate buying, selling and rental services. carhiredalamanturkey.com has been providing car rental services for 25 years at Dalaman Airport, Mugla, Fethiye, Dalyan, Kalkan, Kas, Marmaris, Gocek and Oludeniz. You will find our professional team ready to help and serve you 24 hours a day during your holiday. We wish you safe and enjoyable holiday travel.